The CHRISTOPHER HANLON® brand name is fourth generation Australian with origins that can be traced back to his Great Grandfather, Tom Hanlon® in 1875. From a small piece of land in Goomalibee, Tom grew bush herbs, raised cattle and made regional leather produce. Tom's eponymous HANLON ROAD located in Goomalibee Victoria exists today. Heritage. During the mid 1800's land owners were often considered the local gentry as only the wealthiest of families could afford significant farming and grazing land in addition to the early industrial farming equipment required. According to Christopher's father, ROSS HANLON®, Grandfather Tom Hanlon® employed a number of people to run the family farm and numbers would swell during heavy harvests: sheep shearers, slaughtermen and stockmen in addition to general farm hands would be hired to work the land and production sheds. Meanwhile the women would sew, cook and clean. Whatever could be produced on the farm was sold at local markets and townships using traditional hand skills, time-proven formulas and the family’s savour-faire. Cream was churned into butter – often by the women. Best cuts of meat would be wholesaled to local butchers but skins and animal byproducts would also be put to use. Boiled sheep (wool fat) and emu skin fat for example was a popular treatment for women's parched English skin and when mixed with soap and water doubled as a men's shaving preparation for cut-throat razors. Many Australians relied on small producers or made items themselves: cooking, sewing, knitting and home remedies were a common country practise. Importantly during the mid 1800's a major backbone of Australia's colonial economy in Victoria was provincial farming and agriculture; in addition to associated products such as wheat, herbs, vegetables, wool, meat and leather. The Gold Rush raised the need for such supplies and so became known the HANLON® family name in areas of Benalla, Ballarat, Glenrowan (Ned Kelly was killed there in 1880), Shepparton and Geelong. When Christopher Hanlon's® Great-Great Grandmother Ellen Hanlon® passed away 'The Argus' newspaper (the Melbourne equivalent of today's New York Times or Sydney Morning Herald) reported in her epitaph: Australian 'PIONEER DIES' with a short, poignant, dear-to-heart read. Local word-of-mouth was an important source of news. This is Australian His-Story. A story of the HANLON® family's colonial country empire and the INSPIRATION BEHIND the HANLON® family's international luxury brand. Today HANLON® BRANDED leather goods, natural skin preparations AND AUSTRALIAN BOTANICAL BUSH PERFUMES are integrated into Australian COUNTRY culture. "From a small piece of land in Goomalibee, Tom grew herbs, raised cattle and made regional leather produce. 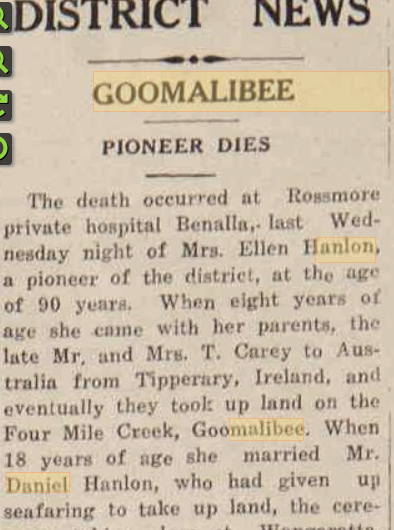 Tom's eponymous 'HANLON ROAD' located in Goomalibee Victoria exists today. Heritage"
During heaviest harvest seasons men, women and children would be seen travelling along Hanlon® Road by foot, horse and cart towards the farm sheds. It was common for people in bush communities to help one another during times of need, especially during harvests. CHRISTOPHER'S GREAT-GREAT GRANDMOTHER (MOTHER OF TOM HANLON) WAS AN 'AUSTRALIAN PIONEER' (THE ARGUS NEWSPAPER EPITAPH). The brand names HANLON®, CHRISTOPHER HANLON® and AUSTRALIA'S FIRST PERFUMER® are Australian Registered Trademarks Protected by Australian Federal Law. Unauthorised use is Prohibited. HANLON® since 1875.